Built to the highest standards, these doors deliver optimal performance over a long life cycle with subsequent lowest possible operational costs. The doors feature wind-resistant reinforced panels for optimum functioning even in the most adverse of weather conditions. The joint design ensures better load distribution and butyl sealing with unbroken corners provide maximum tightness for excellent insulation. 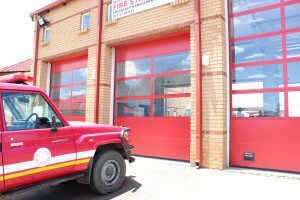 During the upgrade of the Randburg Fire Station in Johannesburg four years ago, strict specifications called for highly reliable and efficient doors with a modern, attractive and unique appearance. Maxiflex’s overhead sectional doors met all the specifications and the fire station did not hesitate in placing an order for a total of ten doors. Maxiflex supplied six doors each to Ivory Park and Alexandra Fire Stations in Q3 and Q4 2017 respectively. Janssen explains that space constraints at the Ivory Park fire station necessitated modification to the track system on the big doors to enable them to pass under one another in the open position. To ensure correct operation of the doors, which is fundamental to optimal functioning and extended product life cycle, Maxiflex provided all necessary product training. “We received reports from both fire stations that they wereimpressed with the look and efficiency that the doors provide,” concludes Janssen. Maxiflex’s turnkey industrial entrance solutions meet a multitude of applications across diverse industries – from mining and automotive manufacturing to food and beverage, hospitality and pharmaceutical. The product offering includes: A range of industrial sectional doors; vertical-lifting fabric doors for large openings and heavy-industry environments; loading dock equipment; PVC strip curtains; protection screens and impact doors. Maxiflex is the sole distributer for ASSA ABLOY Entrance Solutions in the Sub-Saharan Africa. Since opening its doors some 27 years ago to manufacture, supply and install Maxiflex PVC strip curtains, protection screens and impact doors under the name Janssen Products cc., Maxiflex rapidly expanded its product and service footprint. Today the company has cornered the market in the provision of a wide range of world-class quality door and loading dock solutions. Maxiflex holds sole distribution rights for ASSA ABLOY Entrance Systems’ Crawford, Albany and Megadoor brands in the Sub-Saharan region.